Gunmen have stormed two buildings in the Iraqi capital, killing at least 29 people, officials say. At least 20 of those killed were said to be women. 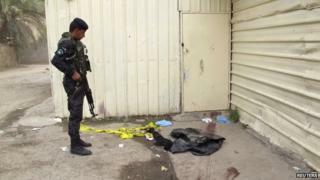 The attack took place late on Saturday in the neighbourhood of Zayouna in east Baghdad, police said. One officer said he "found bodies everywhere". The motive for the killings is not clear. No group has said it carried out the attack. Reports said the two buildings were suspected to be brothels. Writing left on the door of one of the buildings read: "This is the fate of any prostitution," AFP news agency reports. Locals in Zayouna have accused Shia militias of killing women thought to be prostitutes, Reuters news agency reported. The neighbourhood is a mixed district of Sunni and Shia Muslims. A brothel in Zayouna was attacked in May 2013, with seven women and five men shot dead. Prostitution is prohibited under Islam, the dominant religion in Iraq. Iraq is experiencing an upsurge in instability as government forces battle an Islamist insurgency led by the jihadist Islamic State in Iraq and the Levant (Isis), which has seized huge swathes of the country's north-west and closed in on cities near Baghdad. Meanwhile, Kurdish ministers have suspended participation with the government after Prime Minister Nouri Maliki accused the autonomous region of sheltering extremists. The current conflict in Iraq has acquired strong sectarian overtones, with disputes between the Kurds, the Sunnis and the Shia. The Shia-led government is struggling against predominantly Sunni Isis fighters, and other Sunni rebel groups.